It wasn’t the Brandenburg Gate, but in all fairness, someone else put in their deposit before him. 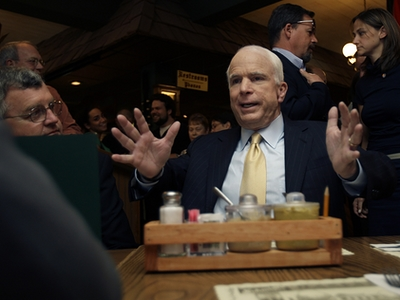 While Barack Obama was floating his Presidential fitness trial balloon this week, peddling his oratory in front of a rabid Berlin audience, Senator McCain was selling his message in a similarly Teutonic, if somewhat more watered-down vein, at Schmidt’s Sausage Haus und Restaurant in Columbus, Ohio’s German Village neighborhood. The McCain campaign has apparently been all veins-a-popping this week at the adulation poured upon Barack Obama for his trip across the pond to visit Iraq, the American troops, and our once and hopefully future allies in Europe. As all three network news anchors and much of the prominent media made the trip with the presumptive Democratic nominee, Team McCain wanted an opportunity to steal some of the young buck’s thunder and his headlines. They had a trip planned for the candidate to the platform of an oil rig off the Louisiana coast, but were stymied by the untimely arrival of Hurricane Dolly. Just as well, as they would have been awkwardly upstaged by the flotsam of 400,000 gallons of heavy fuel oil spilling out of the Mississippi River in a twelve-mile swath from an earlier collision between a tanker and a barge. So back to the German angle. That brought them to…Schmidt’s Sausage Haus und Restaurant. It was well-intentioned, but probably not the place for a thundering exhortation of “Mr. Schmidt, tear down this wall!” Unless, of course, Schmidt’s was hedging on taking out the non-load-bearing partition between their banquet room and the newly-remodeled bier stube. These are the days in the McCain campaign, which by its everyday activities couldn’t make a stronger case for senior-staff drug testing. 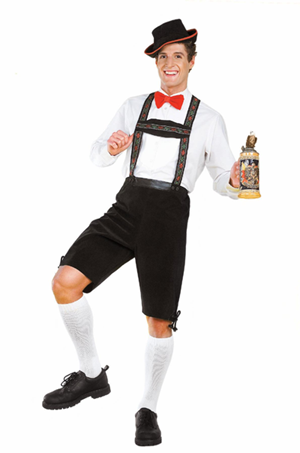 While Barack Obama was stirring up a crowd of 200,000 in Berlin, many of them waving American flags, which were previously thought extinct in the Europe of George W. Bush’s Presidency, the GOP nominee decided to counterstrike with his own oratorical line in the sand in a schnitzel and knockwurst diner. Let’s be clear: I’m not casting any aspersions–I understand their sauerkraut-bratwurst balls are zu sterben. But might it not have been better for all parties concerned if they’d just stayed home and let this Obama Cavalcade play itself out? I don’t imagine there’s a lot of merit pay being dispensed within Team McCain these days. Maybe there should be. It’s possible they’re trying very hard to keep The Candidate on message and striking where and when the iron is hot, and maybe he’s just not getting it. After all, nary a day goes by when he doesn’t have to be corrected on the difference between Sunnis and Shi’ites, or that Anbar Awakening happened before The Surge, or that the Czechoslovakia hasn’t existed since 1993, or that Iraq not only doesn’t share a border with Pakistan (in fact, there is a good 700+ miles of terra firma between the two, and it’s called Iran). In any case, this doesn’t bode well for the Straight Talk Express. On the other hand, they’ve had some fairly stunning poll results of late. One has to suspect the polling methodology–in that most polling organizations still rely on homes with landlines, which excludes an untold number of younger potential voters who told their respective Baby Bell to pound it long ago. However it shakes itself out remains to be seen, we’re still very early in the skirmish. I’m still siding on the case that the McCain camp would do well with a healthy dose of clarification–in message, strategy, and, most of all, fact. I don’t know if that’s possible, or if they’re working with a candidate who’s a hundred days late for a place with a day room. That said, if he’s done nothing else, I know where I’m dining if I ever find myself in Columbus. I don’t think I’ve ever had Bavarian Cabbage Rolls, but I’ll bet you’d be hard-pressed to find those in a throng of 200,000 at the Brandenburg Gate.